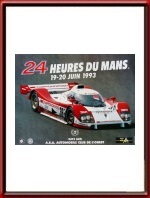 Original 1993 24 Hours of Le Mans Poster. June 19 & 20, 1993. The 1993 Le Mans poster is part of the "The star car used for sponsorship" era in Le Mans posters which lasted from 1981 to 1997. 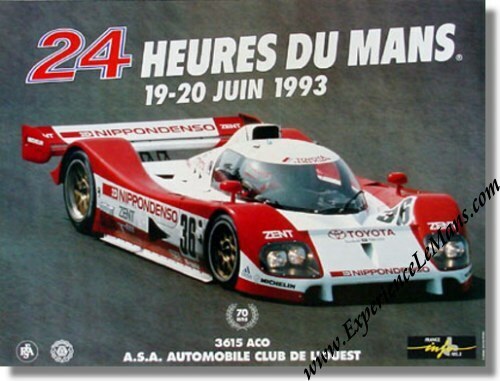 Design of the 1993 Le Mans poster was again in the hands of the S. Conseil agency and is based on a color photograph of a Toyota TS10. The Le mans 24 Hours race had seen the light of day 70 years earlier hence the "70" logo on the 1993 poster. While the Toyota TS-10 on the poster did not win, there were 4 Toyotas amongst the first 8 finishers. The race was won by Eric Hélary, Christophe Bouchut & Geoff Brabham in their # 3 Peugeot 905 Evo 1C with a total of 275 laps to their name. For the full results of this race, please see 24 Heures du Mans results 1993. We only have 1 available.